Payroll management is a complex and long drawn task that needs to be handled month on month by organizations. Salary payouts, whether in mid or large size companies, are equally varied, and with multiple clauses. Since salary calculations and disbursement is so time-consuming many businesses outsource their payroll processing exercise to companies that handle this process for several organizations. Even if outsourced, Human Resources is required to manually key in the payroll inputs based on attendance, leave, incentive, perquisites, tax deduction, exits and other aspects before sending in the data for the month to the payroll management company. Managing and processing salaries can get increasingly tedious as variables will continue to change or grow, and may result in several errors. Having an automated payroll system ensures that any process related issues and errors are eliminated, leading to enhanced productivity across the board. Inspirria, a leading NetSuite payroll solutions provider, offers end-to-end payroll management, which is built for NetSuite. PayEdge helps businesses to automate and simplify the payroll life-cycle which is a time saving and efficient solution. Highly user-friendly and agile, the payroll check software solution makes payroll process digital and seamless, with minimal paper work. The cloud-based system is closely integrated with NetSuite, providing a greater visibility of payroll data across locations and subsidiaries, ensuring optimal budget monitoring, better visibility and control. Automating your payroll processing system streamlines tasks and improves efficiency and Inspirria’s robust solution helps companies of all sizes and sectors to maintain an in-house centralized payroll management system. PayEdge ensures error free processing in a quick and efficient manner. Salary disbursement is timely - month on month - a factor that can indeed prove to be a morale enhancer amongst the employees. Online payslips are made available for the employees in NetSuite Employee Center with additional email functionality for mailing the payslips. A cost effective solution, PayEdge can be managed through a single payroll master with access rights that can be defined and determined. Accurate payroll data also ensures better compliance and governance. Process Group Functionality, a unique feature, helps in the logical grouping of employees and location wise requirements which is an essential requirement for organizations which have multiple offices across the world. Inspirria has over 500 clients across the world and is in collaboration with a number of global companies in various verticals and sectors. Inspirria's cloud based offerings has helped organizations drive operational excellence and enhance profitability. 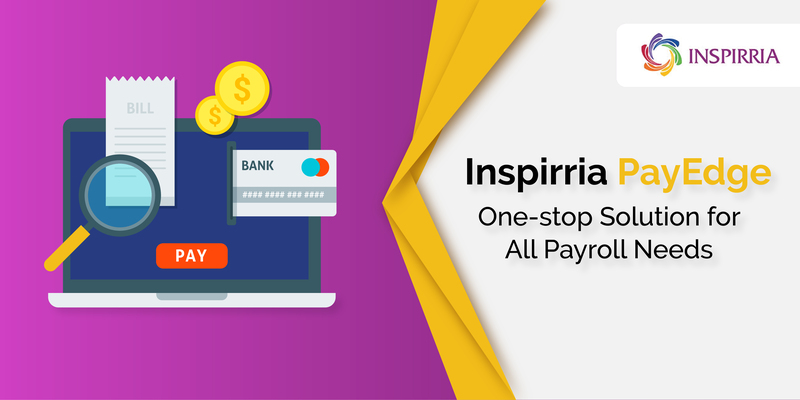 Connect with Inspirria to adopt a single, simple system that can solve all your payroll issues.